Praying That The Truck Stalls. Prayer has been on mind mind today, in particular in regards to some of the situations I’ve been in when traveling in South Sudan. One particular instance comes to mind. I was traveling in the back of a Toyota Land Cruiser with two other missionaries and several natives, going from the town of Bor to a village about three hours north called Liliir. The seasonal rains had run long that year, and there were huge sections of road that were virtually impassible. When I say virtually impassible, what I mean is that some vehicles made it, and some did not. We passed many vehicles that were stuck deeper than the wheels in mud, and were being unloaded to take the weight off so hopefully they could be moved. I remember one that had its rear axle sitting behind it, and was clearly not going to be going anywhere. I have a picture I took of one of those vehicles as we passed. 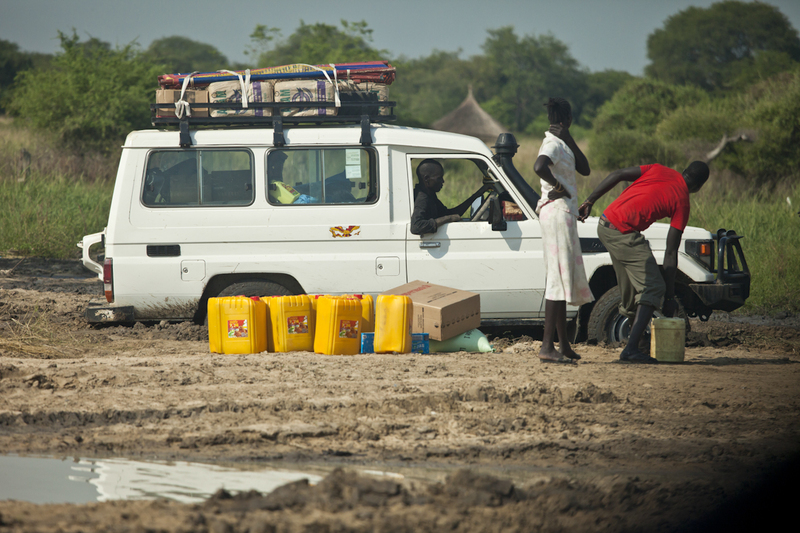 Toyota being unloaded to try to get it out of the mud, South Sudan. So you can see now why we wouldn’t want to be stuck out at night with no way to get back. Despite our loud objections, our driver tried to put the vehicle into four wheel drive low, and descend into the muck. What he didn’t know, though, was that we had a team of people praying for us back home. As our driver tried to put the vehicle into four wheel low, the engine stalled. He started it back up, tried to put it back into four wheel low, and stalled it again. This happened three or four times. Finally, he gave up, backed up the vehicle, and drove to the route we had come through that morning. As he got to the crossing, he dropped the vehicle into four wheel low gear with no trouble and no stalling, and crossed easily. It’s situations like this that make you realize the difference between tourism and missions. It’s not the place you are going that makes the difference, it’s the spiritual currents that are running just below the surface. Is what you’re doing moving things in the spiritual realm? If they are, you are going to face opposition, and this is why those who are still at home in prayer are just as important if not more so than those who actually go. I will probably go into other situations where this was very apparent at a later time. For now though, the subject of prayer is forefront on my mind as some of my friends are currently on their way to Kenya, some of them for the first time. Also, in the next three months, I’ll be going to Kenya as well, and then to Ethiopia. More on that later.